Accumulation of Dental Plaque is the primary cause of gingivitis. The important feature of gingivitis is that there is inflammation, swelling and bleeding of the gums but the underlying bone is not affected. All people have potential to develop gingivitis and interestingly there are up to 70% of people that no matter how much they neglect their teeth will probably only ever get a chronic gingivitis and will never develop the more serious Periodontitis (see below). Plaque is a sticky colorless film, composed primarily of multiple types of bacteria, which adhere to your teeth at and below the gum line. Plaque constantly forms on your teeth, even minutes after cleaning. Bacteria found in plaque produce toxins or poisons that irritate the gums. Some people may have more toxic bacteria in their dental plaque and their gums may become inflamed, red, swollen, and bleed easily. If daily brushing and flossing is neglected, plaque may also harden into a rough, porous substance known as calculus (or tartar). This can occur both above and below the gum line. Periodontitis is the destructive form of gum inflammation and is related to the presence of certain bacterial species being present in your plaque. The important feature of periodontitis is that the gums are swollen and inflamed (just like gingivitis) but there is also destruction of the underlying bone occurring. It is estimated that about 30% of the population have a significant background susceptibility to potentially developing periodontitis. Once you have been diagnosed as having a susceptibility to periodontitis, treatment and optimised preventive care will allow you to stabilise the condition and prevent it from causing bone loss and tissue damage. This is the same as many other medical conditions such as diabetes, high blood pressure and cardiac disease where we know some patients have increased susceptibility to these diseases due to their genetic predisposition however if appropriate treatment and preventive strategies are put in place then the problem can be controlled long term and damage to the body minimised. 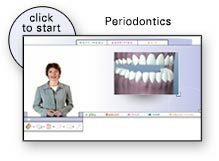 This is important to understand as this means you will need to follow a professional maintenance program and optimise your home dental care to ideally manage your periodontitis. If untreated there is progressive loss of the soft tissue and bone at a rate of up to 2mm per year, which if allowed to progress may result to loosening and subsequent loss of teeth. Periodontitis may be present in up to 80% of the population at some time in their life. However we see the more problematic form of the disease in ~20% of the population. Aggressive Periodontitis, which does not respond well to most treatments is usually seen in 1-2% of the population and these patients not only appear to have the more toxic bacteria but also appear to be more genetically susceptible to the infection leading to more rapid and severe bone and tooth loss.